Khaki tan/green and RARE white phantoms give 3D depth to this Arkansas doubly-terminated cluster with another brilliant phantomed cluster protruding from the main crystal. Large cabinet size, 2x 2-1/4x 4-3/4", and first-shelf center worthy. 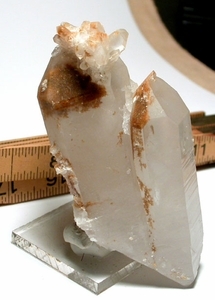 The largest point, 4", is tabular, as is a slightly out-curved white phantom twinned crystal at 2-3/4". A 3-3/4" record keeper crystal, tip penetrated, has a skeletal interior with both chlorite and white phantom. Two prisms are in regrowth - no damage. Tiny rainbows wink here and there, tabular and other barnacles abide. Much to see - and see into. Enjoy!